Eisner commented that running the company “was like being left in a toy shop.” He never associated himself with the image of the corporate raider, fostering instead that of a man in touch with his “inner child.” […] Eisner’s portrayal of himself as just having fun was an updated version of Old Walt’s desire to create a world of clean, well-lighted places, a world in which adult preoccupations with complexity and moral responsibility appear out of place or, perhaps, irrelevant. To this end, it’s easy to see why creating a “tween” demographic would be more appealing to today’s Disney Channel—tweens can be morphed by corporate products and interests while being protected by the silly notion that they aren’t yet teenagers and therefore don’t have to deal with that messy business of adolescence: physical changes to the body, the awkward dating and mating rituals, the desire for independence. In the early days of the basic cable network, though, adolescence was the name of the game. The Famous Jett Jackson used its adolescent star to tell smart stories about censorship, race, class, and the harsh realities of growing up. In A Heartbeat wasn’t always smart, but sometimes managed to be a successful teenaged iteration of the modern medical drama. So Weird is playing the long game with its teen protagonist. The loss of Rick Phillips hangs over the entire Phillips family, leaving them in a state of arrested development—and no one more than Fi, who never really got the chance to know her father. Still, the show remains committed to telling stories about growing up and moving on, often by using some paranormal activity or alien monster to do so. “Escape” is not one of So Weird‘s finest hours: Fi stumbles upon the paranormal event and the girl at the center of it by accident or coincidence, and the theme is a bit ham-fisted in its execution. But it does reflect on the show’s approach to telling stories about this theme. Similarly, while “Simplicity” also has weaknesses, it’s saved by its final plot twist and the energy of its guest character, Tad Raxall. By now, the show has established that it will either do a) some sort of weird or scary monster (“Memory” and “Sacrifice”) or b) a well-documented form of supernatural event (ghosts in “Family Reunion” and fortune telling in “Web Sight”). “Escape” is in the latter category, with Fi opening the episode talking about documented cases of people performing “astral projection”—literally an out-of-body experience—as well as the different kinds of astral projection. 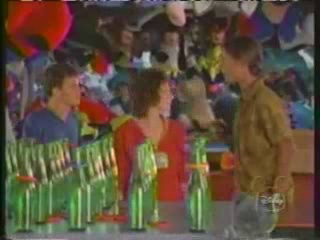 The show then strands the characters at a carnival, which leads to an oddly transcendent moment. When Jack and Clu first see the astral-projection girl at the heart of the story, they declare her “cute” (well, Clu says he “feels like [he’s] in a shampoo commercial”) and immediately begin to fight for her affections. As the two wage carnival-game war in an attempt to win the girl a prize, Claire (aforementioned astral-projection girl) stands in complete silence, watching them. The audience eventually catches on that this is, in fact, the projection of a girl, but the boys don’t even notice that she never says a word until Fi points it out to them later. (Fi, for her part, has Claire walk right through her as she’s returning to her body, which leads to another “I know what I saw!” moment with Jack later.) It’s the story of every badly drawn love triangle in history—the boys babble on while the girl remains silent, unable to assert herself. The metaphors here aren’t too subtle—the broken tree house symbolizing Claire outgrowing her youth and transitioning into adulthood, for example—but they’re fundamentally built towards the teenage audience in an effort to capture the turmoil of adolescence on-screen. When Jack puts together that Claire is probably leaving her body in school or on the bus, he notes that “nobody in their right mind would do that” while Ned, in response to Clu’s petition to have him be on the level of the teens when it comes to teaching math, proclaims, “I was on your level. Being a teenager sucked!” (Incidentally, both “Escape” and “Simplicity” make note of Jack’s apparent skill in mathematics, which nets him a 100 on a homework in the former episode and causes Clu to declare he has an unfair advantage in the latter.) And Claire, in defense of her actions, says, “It’s fun… and it’s free… and it sure beats this.” Despite being a bit blunt, there’s a vague thematic connection about the conflicted nature of adolescence that works almost in spite of its execution. While “Escape” leans on Disney Channel’s chase for teens, “Simplicity” reflects on Eisner’s own stance on technology, as well as the pre-dotcom bubble burst anxieties about technology being used to connect people. The plot involves Molly going back for royalty checks she earned writing a jingle for a friend of hers who became CEO of one of the world’s largest tech companies. The company is Star Dot Star (whose name features prominently in the jingle); the friend is Tad Raxall, played by Garwin Sanford (recently known as Congressman Faraday in Eureka and, slightly less recently, Simon Wallis in Stargate: Atlantis). Tad is representative of the hundreds of men and women who started start-up tech companies in the late 90s—he’s completely unaware of the consequences of his actions. 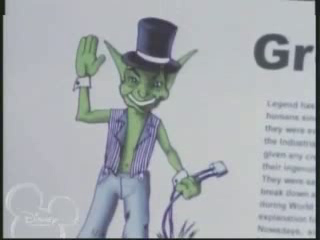 The show makes no bones about this: thanks to gremlins disrupting the local technologies, he’s frequently seen in a state of disarray whenever he shows up in the episode. Fi’s excitement for free software dissipates when he hands her a coupon, as he can’t give her the real beta software yet owing to the technological problems in town. Most of all, Tad spends the entire episode on his metaphorical (and sometimes literal) knees, worshiping Molly’s jingle for saving his company and “putting it on the map,” so to speak. It should strike the audience as a bit bizarre that Fi is the one leading the crusade to sing the amended jingle in order to apologize to the gremlins (for, uh, taking credit for the contributions the gremlins made toward starting the Industrial Revolution). It’s true that Fi has her own website and is somewhat dependent on technology herself, but the search for the strange and unusual, powered by the belief in the father she never knew, supersedes anything else. Implicitly, “Simplicity” plays into Fi’s selfish desires to learn all there is to know about the paranormal creatures and events that exist in the real world. The ending of “Simplicity” is notable for two reasons. First is the sing-along scene. The show again draws a connection to music as a method for bridging gaps and healing wounds, this time centered around one of Molly’s own pieces. The fact that the sing-along doesn’t actually work is the second reason—the gremlins were befriended by Lydia, the sole restaurant owner of Simplicity, Utah, in order to drive Tad crazy. It’s not just a nice touch to a pretty good episode of the show; it’s an indication of how closely the “normal” and “paranormal” can become intertwined. This won’t be the last time someone uses something not of this earth for their own ends. “Escape” and “Simplicity” are still the episodes of a developing series, but both remain fundamental to the show’s own themes as well as to Disney Channel’s desire to seek out a teenage audience. While the show’s main cast includes teenagers, having episodes like “Escape” where the paranormal events feature teens as well is paramount to providing characters teenagers can identify with. And “Simplicity” continues to follow Fi down her rabbit holes while also allowing some space for Molly to begin to move on from the dark period of her life after Rick’s death, when she wrote jingles. Molly fears that the “words [she] wrote” for Tad have created an obsession that is holding him back from being the very best of himself. She, too, could do with some healing songs—but that’s why, after all these years, she wants to be a rock star again. And if these “adult preoccupations” run counter to what The Walt Disney Company stands for, then nobody noticed for a long time that So Weird is a show about adult preoccupations. Cameron White is a freelance writer currently residing in Arkansas. He writes about television over on his blog, Wayward Television, and tweets about Mitt Romney’s incredibly punchable face. His obsession with television was founded in 1996 by The Disney Channel and fostered by his discovery of Firefly in the summer of 2007. He says he wants the revolution, but it never calls him back, so he’s feeling rejected.